Our annual year in review comes a few days early, because Simply Streep is taking a Holidays break. With this last post, I’d like to thank all visitors, and those who have helped me with the site throughout the year, most notably Alvaro, Claudia, Frank, Glenn, Maria, Mouza, Lindsey and anyone I might have forgotten. It has been a great year, but it has been a weird, shameful and scandalous year as well. Meryl has filmed three movies – “The Post” and the upcoming “Mary Poppins Returns” and “Mamma Mia! Here We Go Again” and has won a Golden Globe and Emmy – but what stays in mind is a relentless 12 months of online shaming and accusations, not only by those usual suspects who love to tear down women, but also by those who should know better. So, sit back, let the year pass by and prepare to shake your head, more than once. To all the visitors, I wish you a Merry Christmas, a good time with your family and beloved ones and peaceful Holidays. See you all in 2018. I’m very happy to introduce a new feature to Simply Streep. My favorite part of the site has always been the career section. After all, it’s Meryl’s body of work we’re all celebrating and striving to learn more about. So ever since I was thinking about how to supply all essential information about a project and its making. A lot of effort is put not only into the film, but also into its promotion. So I’ve decided to give each project a press section, showcasing all related public appearances, talkshow visits, articles and award show appearances that came with the respective production. On each film page, you will find a link to the press section in the sub-menu. Let’s take Mamma Mia! as an example: The new sub-site gives you a great overlook on the international press tours for the film, starting in Greece and concluding in Tokyo. There are radio interviews to listen to, talkshow appearances to watch and articles from all countries in the world. The wealth of material depends on how a film was promoted around the world – not every press tour was as extensive as The Iron Lady for example, but there will be great discoveries, especially on her work in the 1980s and 1990s. So, head over to the career page, select a film and then simply click the press coverage to launch the new sites. I hope you enjoy browsing them as much as I do. 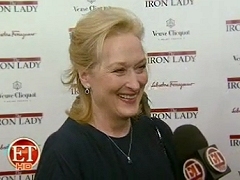 Besides her film work, a big part of Meryl’s career consists of narrations for television programs, documentaries and feature films. It’s a wide range of interests, from human rights and nature to art and music. 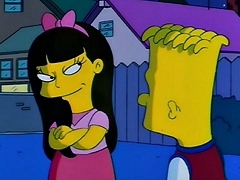 And probably even something for her children to watch (The Simpsons and King of the Hill). 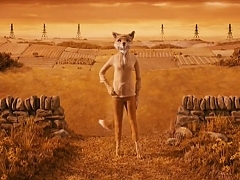 Especially in her feature voice work, it’s amazing how even animated characters come to life through her voice, just have a look at the amazing “Fantastic Mr. Fox” and the equally odd but entertaining “Higglety Pigglety Pop” from 2010. Three new categories have been added to the video archive, Narration: Film & Television, Narration: Documentaries and Miscellaneous Productions with over 50 additions of excerpts, behind-the-scenes recordings and trailers. Also, make sure to visit the career page to learn more about these projects. Enjoy. Since yesterday’s update on the video archive (and lamenting on how long it may take to have it completed), I’ve been on a good roll, thanks in particular to the bad weather, and have finished all remaining categories. The news segments are now done with all clips from 2010 to 2017, including lots of entertainment shows interviews and red carpets bits. The public appearances feature all kind of press conferences, conversation panels and premieres and the miscellaneous section boasts a great collection of vintage and recent public service announcements, and basically everything that doesn’t fit into the other categories. I’m sure there are still some clips missing, and some waiting to be discovered. But for now, that big part of Simply Streep is back and ready to be discovered. Enjoy! The video archive takes longer to be completed than I have expected, simply because there are so many videos left to be added. But at least I’m making progress. Today, clips from news segments, ranging from 2006 to 2010 have been added. Within these 5 short years, Meryl’s career blossomed from “the star of the old days” to a global superstar, thanks to the successes of “The Devil Wears Prada” and “Mamma Mia”, not to mention the releases of “Doubt”, “Julie & Julia” and “Its Complicated” within a year. 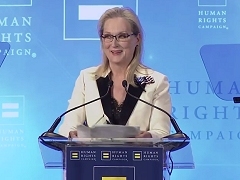 It has been great to revive all these clips from international promotion tours and red carpets, and to be reminded that HD isn’t that old fashioned – most of these clips are in a rather bad quality – but Simply Streep wouldn’t be a proper archive without this “old stuff”. I’ll do my best to finish the news segments and also the other remaining categories to have the video archive finished in time. Until then, enjoy the new old additions. 2016 was a rather quiet year in Meryl Streep’s career, but a year filled with the Summer success of “Florence Foster Jenkins”, political acitivism in a year of terror and change, and sad losses. 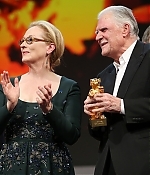 In February, Meryl Streep was president of the jury at the Berlin Film Festival, honoring the refugee crisis documentary “Fire at Sea” with the festival’s Golden Bear. 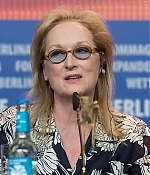 Members of Streep’s jury were Clive Owen, Alba Rohrwacher, Lars Eidinger, Malgorzata Szumowska, Brigitte Lacombe and Nick James. 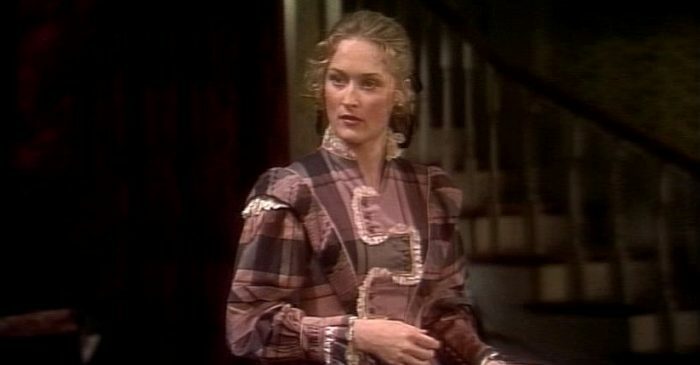 I’m very happy to launch Simply Streep’s new video archive today. Why new, you may ask? The script I was using for the video archive as we know it did not stand the test of time. With most visitors browsing Simply Streep on their mobile phones or tablets, many have complained that clips were not running properly on their mobile devices. So it was time to find a solution. The new video archive is mobile-friendly and the videos should be playing on all devices. For now, it’s not nearly as complete as the old archive – but there are over 400 clips of Meryl’s film work, all sorted and replaced with high quality videos. I will continue to sort all clips and add them as time permits. Until then, the old video archive will remain online. 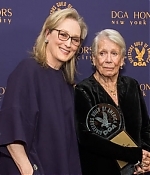 With the launch of the new video archive, clips of Meryl’s recent appearances at the Rome and Tokyo International Film Festivals have been added. Have a look, browse around and check back later for more clips being added. 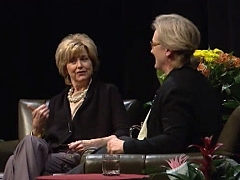 Back in 2011, I’ve created a site special called “Conversations and Panels”, writing about the Q&As that Meryl Streep has participated in through the years. There weren’t many, and unfortunately the section got neglected by me as fast as I started working on it. Little did I know five years ago how important and extensive conversation panels would become for today’s movie promotions. The way films are promoted these days is vastly different compared to, let’s say, 10 to 20 years ago. There aren’t that many in-depth interviews in magazines anymore, since magazines aren’t that big anymore. Sometimes, depending on a film’s budget, all there is is a press conference from which everyone takes their bits of news. But conversation panels and Q&As have increased over the years, and it’s become the best way to learn more about the projects that are talked about. The interviews are unfiltered and done in person, and many organizations are streaming the Q&As live or after they’ve taken place. 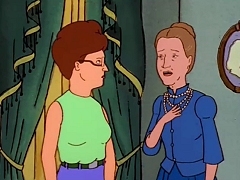 I was surprised, while updating the conversations special, that Meryl has done over 30 conversation panels in the last 5 years! Long story short, head over to the newly-titled In Conversation for a comprehensive list of panels of Q&As, filled with quotes, pictures and videos. If you know about any Q&As that I might have forgotten about, please drop me a line. Welcome to the latest version of Simply Streep. With this new look, the site has been fully converted to being responsive, which means you can browse it easily on your mobile device. The photo gallery has received a matching layout. Many thanks to Carol for helping me out with coding and to Claudia for being such a constant support. Thanks to both of you. With Florence Foster Jenkins being released and The Nix being the only official announcement as a future project, let’s use the spare time for some cool new features and additions to Simply Streep. P.S. As many of you have written me in the past weeks, many videos in the video archive have stopped playing on a variety of mobile devices, which has something to do with the script used for the video archive. I’m sorry it’s not working properly, but I’ll be working on a solution. In the meantime, enjoy the new layout, look around and enjoy your stay.